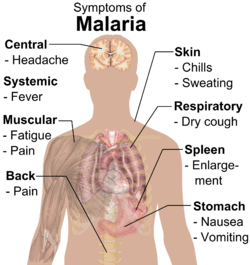 The classic symptom of malaria is paroxysm—a cyclical occurrence of sudden coldness followed by shivering and then fever and sweating, occurring every two days (tertian fever) in P. vivax and P. ovale infections, and every three days (quartan fever) for P.��malariae. P. falciparum infection can cause recurrent fever every 36–48 hours, or a less pronounced and almost continuous fever. ^ a b Fairhurst RM, Wellems TE (2010). "Chapter 275. Plasmodium species (malaria)". In Mandell GL, Bennett JE, Dolin R. Mandell, Douglas, and Bennett's Principles and Practice of Infectious Diseases. 2 (7th ed.). Philadelphia: Churchill Livingstone/Elsevier. pp. 3437–62. ISBN 978-0-443-06839-3. ^ Abba K, Deeks JJ, Olliaro P, Naing CM, Jackson SM, Takwoingi Y, Donegan S, Garner P (2011). Abba K, ed. "Rapid diagnostic tests for diagnosing uncomplicated P. falciparum malaria in endemic countries". Cochrane Database of Systematic Reviews (7): CD008122. doi:10.1002/14651858.CD008122.pub2. PMID 21735422. ^ Lengeler C (2004). Lengeler, Christian, ed. 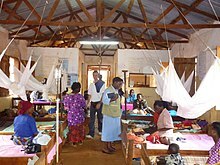 "Insecticide-treated bed nets and curtains for preventing malaria". Cochrane Database of Systematic Reviews (2): CD000363. doi:10.1002/14651858.CD000363.pub2. PMID 15106149. ^ Tanser FC, Lengeler C, Sharp BL (2010). Lengeler C, ed. "Indoor residual spraying for preventing malaria". Cochrane Database of Systematic Reviews (4): CD006657. doi:10.1002/14651858.CD006657.pub2. PMID 20393950. ^ Enayati AA, Hemingway J, Garner P (2007). Enayati A, ed. "Electronic mosquito repellents for preventing mosquito bites and malaria infection" (PDF). Cochrane Database of Systematic Reviews (2): CD005434. doi:10.1002/14651858.CD005434.pub2. PMID 17443590. Archived from the original on 2016-05-03. ^ Meremikwu MM, Donegan S, Sinclair D, Esu E, Oringanje C (2012). Meremikwu MM, ed. "Intermittent preventive treatment for malaria in children living in areas with seasonal transmission". Cochrane Database of Systematic Reviews. 2 (2): CD003756. doi:10.1002/14651858.CD003756.pub4. PMID 22336792. ^ Meremikwu MM, Odigwe CC, Akudo Nwagbara B, Udoh EE (2012). Meremikwu MM, ed. "Antipyretic measures for treating fever in malaria". Cochrane Database of Systematic Reviews. 9: CD002151. doi:10.1002/14651858.CD002151.pub2. PMID 22972057. ^ Waters NC, Edstein MD (2012). "8-Aminoquinolines: Primaquine and tafenoquine". In Staines HM, Krishna S. Treatment and Prevention of Malaria: Antimalarial Drug Chemistry, Action and Use. Springer. pp. 69–93. ISBN 978-3-0346-0479-6. Archived from the original on 2016-06-17. ^ Sinclair D, Donegan S, Isba R, Lalloo DG (2012). Sinclair D, ed. "Artesunate versus quinine for treating severe malaria". Cochrane Database of Systematic Reviews. 6: CD005967. doi:10.1002/14651858.CD005967.pub4. PMID 22696354. ^ Dondorp AM, Yeung S, White L, Nguon C, Day NP, Socheat D, von Seidlein L (2010). 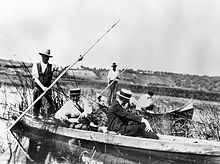 "Artemisinin resistance: Current status and scenarios for containment". Nature Reviews Microbiology. 8 (4): 272���80. doi:10.1038/nrmicro2331. PMID 20208550. ^ Hay SI, Okiro EA, Gething PW, Patil AP, Tatem AJ, Guerra CA, Snow RW (2010). Mueller I, ed. "Estimating the global clinical burden of Plasmodium falciparum malaria in 2007". PLoS Medicine. 7 (6): e1000290. doi:10.1371/journal.pmed.1000290. PMC 2885984. PMID 20563310. ^ Prugnolle F, Durand P, Ollomo B, Duval L, Ariey F, Arnathau C, Gonzalez JP, Leroy E, Renaud F (2011). Manchester M, ed. 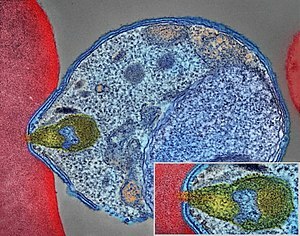 "A fresh look at the origin of Plasmodium falciparum, the most malignant malaria agent". PLoS Pathogens. 7 (2): e1001283. doi:10.1371/journal.ppat.1001283. PMC 3044689. PMID 21383971. ^ Melville CH (1910). 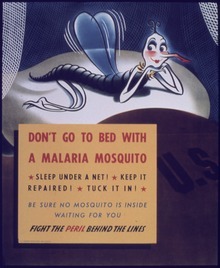 "The prevention of malaria in war". In Ross R. The Prevention of Malaria. New York: E.P. Dutton. p. 577. Archived from the original on 2016-03-12. 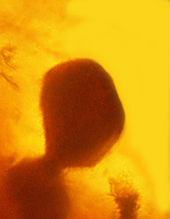 ^ Graves P, Gelband H (2006). Graves PM, ed. "Vaccines for preventing malaria (blood-stage)". Cochrane Database of Systematic Reviews (4): CD006199. doi:10.1002/14651858.CD006199. PMID 17054281. ^ Graves P, Gelband H (2006). Graves PM, ed. "Vaccines for preventing malaria (SPf66)". Cochrane Database of Systematic Reviews (2): CD005966. doi:10.1002/14651858.CD005966. PMID 16625647. ^ Rich SM, Ayala FJ (2006). 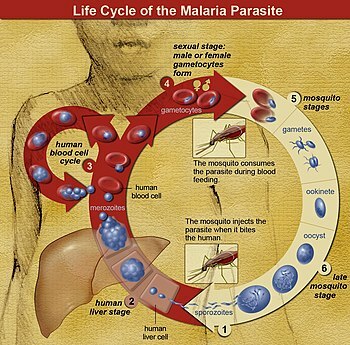 "Evolutionary origins of human malaria parasites". In Dronamraju KR, Arese P. Malaria: Genetic and Evolutionary Aspects. New York: Springer. pp. 125–46. ISBN 978-0-387-28294-7. Bynum WF; Overy C, eds. (1998). The Beast in the Mosquito: The Correspondence of Ronald Ross and Patrick Manson. Wellcome Institute Series in The History of Medicine. Rodopi. ISBN��978-90-420-0721-5.